Just when I was finally able to start moving without looking like an 87-year old woman who barely gets up and walks around, I did another hard workout at the gym. I psyched myself to get up in the middle of the insane rain and stormy weather we're currently experiencing in Los Angeles and leave my apartment during my lunch break to go to the gym. I did this for a couple of reasons. First, it's still insanely busy at my gym. I was hoping that all the New Year's resolutioners would have scurried back to their couches and resumed their inactive lifestyle. Unfortunately, that's not happening as quickly as I'd like. I wasn't a member of Equinox this time last year (I didn't join until April or May), so I have no way of knowing exactly how long this will last. Secondly, because of the rain, the gym is even MORE crowded, even WITH the New Year's resolutioners. So to avoid a massive, crowd, off I went on my lunch break. Squats (5x8- 85lbs!). I think this is the heaviest weight I've ever used to squat with and it was definitely a challenge. Squat jumps (4x10). Not the easiest or most fun exercise to do, especially if you're got a little extra jiggle to your body. But effective, for sure. Assisted pull-ups/Lat pull-down (5x4- body weight)/(5x4- 50lbs). 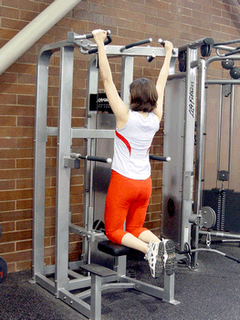 For this exercise, I start out doing assisted pull-ups. I try to do as many reps as I can...and this time around, could only do four of each rep. Therefore the other four needed to be done on the lat pull-down machine. 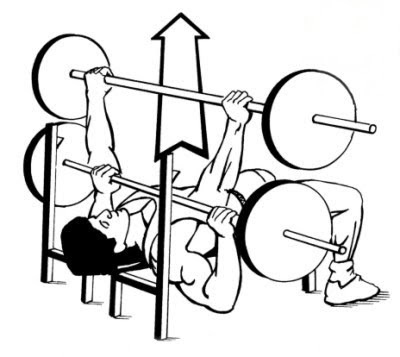 Hanging leg raise (5x8). Because this exercise killed me last time I did it, I modified it slightly and used a different machine. I did the same movement, but it definitely wasn't as challenging. I WILL go back to the other method, but I'm going to work my way up to it. Bench press (5x8- 85lbs!). Again, I think this is the most weight that I've ever bench pressed with. I was only slightly wobbly. 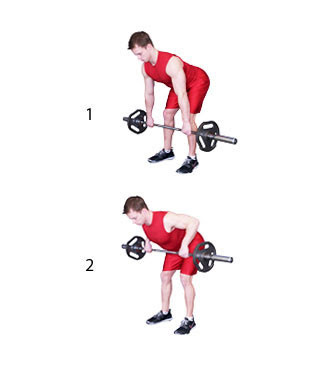 Barbell bent row (5x8- 55lbs). Must work on my form for this one. I finished this off with a 12-minute elliptical interval session, doing 1-minute easy and 1-minute sprint, trying to keep my HR around 155- 165. By the time I was done, I was feeling very tired, but happy to have gotten my workout done. It's nice to know that I have a workout day off soon too. I may take that tomorrow. Oh, and in case you're wondering, I DID make it to the gym last night! Around 830pm I once again forced myself to go out in the rain and did some cardio- elliptical for 30 minutes and then the stairs for 5 minutes (the stairs KILL me).